From 23 January, you can start using a version of a new design for the staff landing page. Find out how we're testing the new design and how you can try it out. The new design should help you complete tasks more quickly and easily. Starting on Wednesday 23 January 2019, the Department of Marketing & Communications is testing two versions of the new staff landing page design on the live website. When the test starts, you'll be able to opt in to the trial from the current staff page. We're running an A/B test on the new page design. This is a way of testing which version of a web page works best by randomly showing people one of the versions. If you decide to opt in, you could see either version of the page and will have the chance to tell us what you think through a feedback form. The test will run until Tuesday 5 February, when we'll revert to the current staff landing page and review your feedback. During the test, we'll collect your feedback and usage data about both versions of the new design. The usage data will allow us to compare the two versions of the new design and see which one works best. Your feedback will help us understand what you think works well or not so well on the page. We'll then make any necessary improvements to the page based on the combined data and feedback. The staff landing page test is one of the final stages in a project to transition the University website into a modern, mobile-responsive design, providing a better experience for our users. The new design follows the same style as other transitioned web pages, giving you a more consistent experience as you use the website and, like all transitioned pages, it's mobile responsive so you can use the page easily on any device. 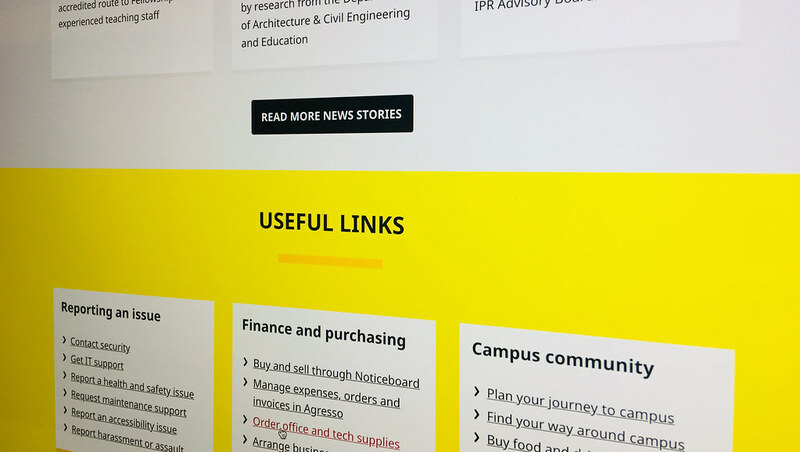 Both versions of the new staff landing page design give you access to the same news, events and services you get on the current page, but they should help you complete tasks more quickly, no matter how long you've worked at the University. Find out more about the new design for the staff landing page. From Wednesday 23 January, you should be able to see a button inviting you to try out the new design at the bottom of the current staff landing page. If you click the button, you'll be taken to the new staff landing page design, where you can find the same news items and useful links as on the current page. When you've set the new design as your default page, the opt-in bar will minimise after a few seconds. When you have set the new design as your default page, you can tell us what you think about it by clicking ‘Submit feedback about this design’, then 'Tell us what you think'. If you're viewing the design on mobile, tap the 'Submit feedback' button. You can return to the old page at any time by clicking ‘Submit feedback about this design’, then 'Reset the old design as default'. If you're using a mobile, tap 'Reset default'.